Joomchi is a traditional Korean technique of felting Mulberry fibers (Hanji) that creates strong, textural and painterly surfaces by layering and agitating Hanji with water. Release your creativity and immerse yourself in a 3 day hands-on Joomchi workshop and learn its history, practice and role in Korean society. Ania will share how she alters the properties of fibers to create a range of papers from smooth leather-like to strong textural pieces and its applications in contemporary art practices. We will create a wall hanging and personal jewelry piece. Joomchi can be incorporated in 2-D & 3D form into surface design, collage, drawing, wearable art, and serve as a functional or fine art sculptural object. Jednodniowe eksperymentalne warsztaty artystyczne metodą znanego od ponad 5000 lat naturalnego barwienia tkanin z użyciem elementów roślinnych, liści, kwiatów, kory drzew, korzeni oraz grzybów i porostów w celu tworzenia wzorów na pograniczu abstrakcji i tkaniny artystycznej. Uczestnicy będą mieć możliwość zaprojektowania nadruku na jedwabiu metoda Eco Dyeing zainspirowaną procesem Australijskiej artystki Indii Flint, którego rezultatem ma być autorskie dzieło o funkcji dekoracyjnej lub użytkowej. używanych roślin w procesie farbowania naturalnego. Ania Gilmore urodziła się w 1968 roku w Warszawie. Studiowała i otrzymała dyplom z wyróżnieniem w zakresie grafiki z Massachusetts College of Art and Design w Bostonie, studiowała grafikę, sztukę książki artystycznej, sztukę papieru i tkaniny w Rhode Island School of Design, School of the Museum of Fine Arts w Bostonie oraz w Haystack Mountain School of Crafts w Maine. Ania była kuratorem wystaw "Book Art the world of limitless", "Nothing twice (Nic dwa razy)" w Artspace Gallery w Maynard, MA,"Resonance: books in time" w Rochester Public Library, Rochester NY, "Resonance: books in time II" w Brickbottom Gallery, Somerville, MA, oraz zaproszonym kuratorem ze strony USA "Correspondence 9th International Book Art Festival" w Polsce. Ania jest wielokrotnie nagrodzoną artystką, a jej prace znajdują się w kolekcjach publicznych i prywatnych w Australii, na Węgrzech, Iraku, Japonii, Korei, Polsce, Rumunii, Wielkiej Brytanii i USA, a także jej prace znajdują się w książce "1,000 Artists' Books: Exploring the Book as Art", Piotra i Donny Thomas. Ania mieszka i pracuje w Lexington w stanie Massachusetts. Joomchi is a traditional Korean technique of felting Mulberry fibers (Hanji). The process is quite meditative and joyful, even though it requires a lot of energy and strength. 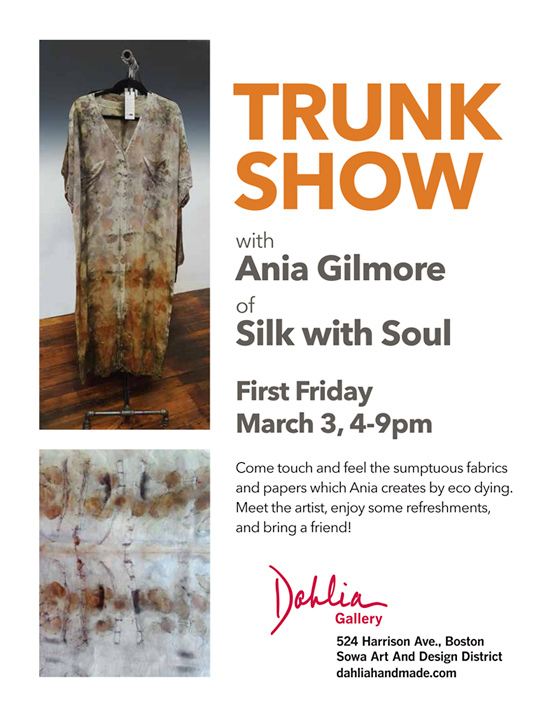 Ania will share how she alters the properties of fibers to create a range of papers from smooth leather-like to strong textural pieces and its applications in contemporary art practices. Ania’s work has been exhibited in museums and galleries in United States, Europe, Australia and Korea, and it is included in numerous public and private collections. 'WORDplay' features art inspired by text. As you will see, some artists have a way with words. For some, a book, poem or newspaper article inspires their work. For others, text becomes an integral part of the image, while still others engage us with art that references a play on words. Reception: Thurs., Sept. 21, 5–8 pm. Featuring 100 works of art that form a testament to the vital role role of the arts, literature and culture and their enduring importance in furthering social justice. 98 printmakers’ collaborative response to the bombing of the Al-Mutanabbi St. Book Market. 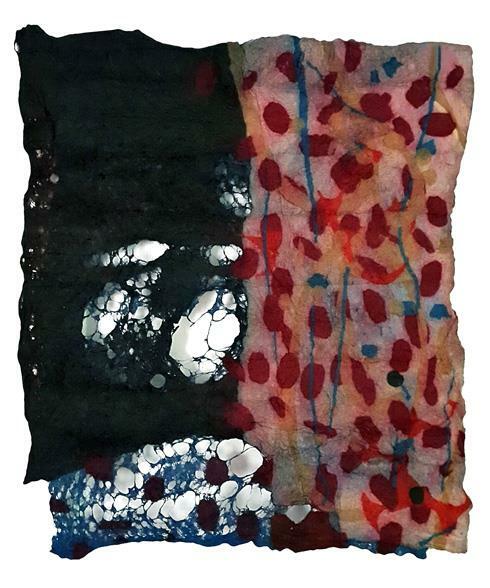 This contemporary fiber exhibition is curated by Marcia Young, publisher of Fiber Art now, a fiber art periodical and community that explores the wide breath of fiber as an artistic medium. The show of virtuoso works by national artists includes nearly every form of fiber art, including weaving, felting, tapestry, needlework, basketry, handmade paper, silk painting, and book arts. Interwoven: Art Meets Nature will connect the natural world with the materials and techniques that are so familiar to all of us, in an engaging, nature-based show of contemporary fiber art and textiles. Featured Artists: Anastasia Azure, Joyce Utting Schutter, Sharon McCartney, Lanny Bergner, Liz Alpert Fay, Ashley Blalock, Danielle Bodine, Jeanne Flanagan, Ann Forbush, Mary Edna Fraser, Amy Genser, Ania Gilmore, Katherine Glover, Kristina Goransson, Louise Hill, Ferne Jacobs, Nancy Koenigsberg, Jean Koon, Al Krueger, Mariko Kusumoto, Chunghie Lee, Youngmin Lee, Kathryn Leighton, Niraja Lorenz, Dorothy McGuinness, Rebecca Mezoff, Merrill Morrison, Elin Noble, Lynn Bollard, Stacy Polson, Wen Redmond, Jóh Ricci, Kathryn Rousso, Lois Russell, Barbara Shapiro, Michelle Sirois-Silver, Mallory Weston, Elizabeth Whyte Schulze. Join us for a reception celebrating the opening of New England on Paper: Contemporary Art in the Boston Athenæum's Prints & Photographs Collection, curated by Catharina Slautterback. The exhibition will showcase contemporary prints, drawings, and photographs by New England artists, reflecting diverse interpretations of the region's built and natural environment as well as its rural and urban culture and society. Selected artists: Joel Allen, David/Pat Bacharach/Hickman, Nicole Benner, Malin Bobeck, Pat Burns-Wendland, Betty Busby, Anna Carlson, Deborah Corsini, Ania Gilmore, Katherine Glover, Anna Kristina Goransson, Meredith Grimsley, Henry Hallett, Nazanin Hedayat Munroe, Patricia Kennedy-Zafred, Jean Koon, Mariko Kusumoto, Jeannet Leendertse, Dorothy McGuinness, Alicia Merrett, Elizabeth Odiorne, Jacky Puzey, Shauna Richardson, Kathryn Rousso, Lois Russell, Chloe Sachs, Diane Savona, Matt Tommey, Heather Ujiie, Deloss Webber, Wendy Weiss, Jane Whitten, Jayoung Yoon. Fiber in the Present Tense 2016 is a juried exhibition to showcase the fiber artwork of the MA/RI Chapter of the Surface Design Association (SDA). Opening Reception: Sat., Nov. 12, 11 am-1pm. Sat., November 12, 11 am. — 1 pm. I am very happy to share a great news, that my Joomchi paper pieces Day 1 and Day 11 have been awarded 1st place by the juror of the exhibition. I am very happy to share a great news that my book Knowledge Inc. has been awarded 1st place in the Altered Book category of the 5th Annual International Juried Exhibit: Art of the Book 2015 in Rochester Public Library, Rochester, NY. works of art realized in the form of a book. They are often published in small editions, though sometimes they are produced as one-of-a-kind objects referred to as ‘unique.’ Artist Books have employed a wide range of forms, including scrolls, fold-outs, concertinas, or loose items contained in a box as well as bound printed sheets. Artists have been active in printing and book production for centuries, but the artist book is primarily a late 20th century art form. any book, old or new, that has been recycled by creative means into a work of art. They can be rebound, painted, cut, burned, folded, added to, collaged in, gold-leafed, rubber stamped, drilled or otherwise adorned…and yes, it is legal. The first edition of the Britannica Junior was published in 1934, in response to a growing interest for encyclopedias designed specifically with children in mind. Often heavily illustrated, encyclopedias intended for younger audiences sought to teach through both text and image. Britannica Junior was not the first of its kind, for a number of popular children’s encyclopedias were published earlier in the twentieth century, but it was a welcome addition to the genre. We are pleased to have these reinterpretations of the 1934 Britannica Junior on view, as each work offers a nuanced view of the book as art, visually and intellectually. These works push the Britannica Junior beyond its original intent and invite the viewer to consider it as both a transmitter of information and an art object. The Bookmarks projects series aims to encourage appreciation of work in the format of the artist's book. Participating artists each produce an edition of 100 signed and numbered bookmarks to give away through distribution boxes at venues around the world.Over the last thirteen years, the Bookmarks series of free artwork distribution has visited 137 galleries, bookstores, workshops, centres, schools and libraries in Australia, Brazil, Canada, Croatia, Cyprus, Denmark, Egypt, France, Germany, Iceland, Ireland, Italy, Japan, The Netherlands, New Zealand, Norway, Poland, Singapore, Spain, South Korea, Switzerland, Turkey, the UK and USA. 513 artists have contributed 51,300 bookmarks to the thirteen projects to date. The artists’ bookmarks are divided into 100 sets; one full set being sent to each of the contributing artists and the rest divided and sent in distribution boxes to participating host venues around the world, for visitors to take.Each bookmark is stamped with the current Bookmarks project website address, which directs the taker of the bookmark to the gallery section of the website. Bookmarks will be on display from 19th September to coincide with the Manly Library Annual Zine Fair as part of Manly Arts Festival 2015. Bookmarks will be shown during BILA III (the 3rd edition of the Biennial for the Artist’s Book Treviso, Veneto Region) from 10th October - 2nd November 2015. Opening Saturday 10th October at 6pm. NabilaFluxus will also be show the bookmarks at the arts market on the first and third Sunday of each month at the former St. Anthony Church, Piazza Di La Rotonda, 31050 Badoere, Morgano, Treviso, Italy. 3.0 of The Book as Art emphasizes the art form that can be a delight to the eye, a pleasure to the hand, and made tangible in forms that introduce us not only to new interpretations of an ancient concept but also to questions and ideas on 21st century form and format. This is an exhibition that has been described by critics as, "wildly eclectic" and finding ". . . new and often startling ways to reimagine not just the physical format of a book but also the ideological essence of the content." (ArtsATL, “Year in Review,” Dec. 31, 2014); approaching "sheer aesthetic magic"
Jurors: Margot Ecke, Athens, GA; Arlyn Ende, Sewanee, TN; and Jeff Rathermel, Minneapolis, MN. Artists: Charlene Asato, Mountain View, Hawaii | Marc Addison Brown, Centennial, Colorado | John Deamond, Burtonsville, Maryland | Lindsey Dunnagan, Fort Worth, Texas | Geraldine Craig, Manhattan, Kansas | Elmile "Annie" Donovan, Tallahassee, Florida | Stacy Elko, Lubbock, Texas | Aaron Frondorf, Kansas City, Missouri | Ania Gilmore, Lexington, Massachusetts | Francine Goodfriend, Santa Rosa, California | Fred Hagstrom and Stan Honda, Saint Paul, Minnesota | Karen Hardy, Asheville, North Carolina | Candace Hicks, Nacodoches, Texas | Shireen Holman, Montgomery Village, Maryland | Sarah Hulsey, Somerville, Massachusetts | Jess Jones, Decatur, Georgia | Lauri Jones, Decatur, Georgia | Rachel Kirk, Ellensburg, Washington | Carole Kunstadt, West Hurley, New York | Isabel Lederman, Philadelphia, Pennsylvania | Susan Lenz, Columbia, South Carolina | Woody Leslie, Chicago, Illinois | Macey Ley, Atlanta, Georgia | Cynthia Lollis, Decatur, Georgia | Susan Makov, Salt Lake City, Utah | Danielle McCoy, Atlanta, Georgia | Barry O, Athens, Ohio | Lynn Skordal, Mercer Island, Washington | Mathew Sutter, Philadelphia, Pennsylvania | Barbara Tetenbaum, Portland, Oregon | Arlene Tribbia, Chicago, Illinois | Melissa Wagner-Lawler, Milwaukee, Wisconsin. I am very happy to share a great news that my book Library of Alexandria was selected by the jurors of The Book as Art 3.0: No Jacket Required, for the second place award. The jurors stated: "We deliberated at length and considered the quality of execution or craftsmanship, content (originality and clarity), and how these were reflected in the choice of materials and structure in each work." International Joomchi & Beyond Art Exhibition "Traditional & Transformational"
In this international paper exhibition, New Bedford’s rich fiber history intersects with the Korean tradition of Joomchi and truly is a crossroads where East meets West. Contemporary artists from USA, Korea, Australia, Poland, China, and Netherlands working in Joomchi are pushing the envelope of this very traditional art form. 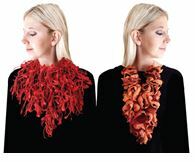 Moving beyond functionality, they are exploring the textural qualities, the expressive coloring that can be achieved, with the unique qualities of the material created by the transformation of paper through the Joomchi process. Add in a diverse group of artists drawn from different cultures and continents, and the show offers an informative and encompassing look at Joomchi today. Traditional & Transformational investigates the varied directions and perspectives being pursued in fiber today. Chung’s choice of artists initiates an interesting conversation for viewers around the theme of how ancient traditions can inspire and inform new works. IAKH – Internationale Ausstellung für Künstlerbücher und Handpressendrucke (Germany). This exhibition of individual and collaborative artists’ books by Ann Forbush, Ania Gilmore, and Annie Zeybekoglu chronicles the journey and intersection of a shared artistic vision. Each of the three artists’ individual works were selected by the other two responding to a shared aesthetic, a common curiosity, or an engagement with materials. Collaborative works evolved naturally from this process, and are expressions that celebrate both solo voices and harmonic exchange, creating balance and growth provoking conversations. July 25 - August 23, 2014. Artist Print Book Exhibition "Mokuhan - Ehon"
Selected Artists: Di Oliver (UK), Minako Murata (Japan), Rosanna Jurisevic (Australia), Ania Gilmore (Poland/USA), Karen Kunc (USA), Yoshiko Hashizume (Japan), Helen Knowles (UK), Alina Özyurt (Austria), Kanako Watanabe (Japan), Aki Kawamura (Japan), Debra Bowden (Ireland), Wong Chi Ling (Hong Kong), Ayumi Umakawa (Japan), Sumi Perera RE (UK), Miyuki Ninomiya (Japan), Ioulia Akhmadeeva (Mexico), Karen Helga Maurstig (Norway), Tuula Moilanen (Finland), Helen Best (UK). Presenting works of 88 artists from Europe, USA and Asia. A juried exhibition of book works juried by Luise Poulton, Managing Curator for the Rare Books Division, Special Collections, J. Willard Marriott Library, The University of Utah. Women in the Arts is an annual exhibition event which coincides with International Women’s Day (March 8) to highlight the value of female artists’ contribution to the cultural heritage of Australia. Previous years have allowed artists to respond to themes such as 100th year of International Women’s Day, The Bag: Object or Obsession and States of Play: Contemporary Australian Women in Regional Arts Practice. Plans are currently underway for the 2014 event which will see a new twist on this celebratory exhibition to include regional, national and international artists. International Juried Show. Four blue walls, blue ceiling, blue windows. Blue apples in a blue bowl. Books, carpet, phone -- all blue. Breathing blue; feeling blue: the intriguing shades of ultramarine, indigo, cobalt, lapis lazuli or the deep, aching blue of sadness, uncertainty, and feeling lost? Where are you, bright blue shades of hope, joy and peace? Participating artists: Amy Hassan, Ania Gilmore, Anna Mroczkowski, Brian Pirman, Bullet, Danielle Nelisse, Dawn Hawks, Geo Alderson, Geovani Galvez, Gipsy Wisdom, Irina Sztukowski, Jackie Stevens, Jessica Joslin, Karen Bennett, Kate Froemling, Kelly Wantuch, Peter Hagerty, Rachel Lynn Sylvan, Rob Millard-Mendez, Samara Kaufman, Suja Jacob, Tobi Star Abrams, Vida Sacic, Yueqi Zhang. The book is an enduring symbol of knowledge and freedom, two basic components of all public libraries in the world. For centuries, books have played a significant role in world history, recording not only the history itself, but also inciting history-making events and keeping people informed of what transpires in the world around them. Books can be many things, from simple blocks of text bound together, to lushly illustrated stories, to handsomely bound and printed volumes. They can be well-thumbed paperbacks; dog-eared, much-loved hardcovers; or delivered wirelessly to an 8-inch screen. Books can be read and savored alone and in silence, or they can be cherished and read aloud. In all their forms, books are magical things, and the 'Art of the Book' is intended to showcase all that magic. Participating artists: Laurie Alpert, Nancer Ballard, Carol Blackwell, Patty Bruce, Kate Castelli, Diane Dolan, Helene Elsborg, Phoebe Ann Erb, Ania Gilmore, Ruth Ginsberg-Place, Roni Gross, Cristina Hajosy, Sarah Hulsey, Jeff Jampel, Ronni Komarow, Jeanette O'Connor, Bonnie Rosenthal, Margaret Scoppa, Fay Senner, Alexandra Sheldon, Martha Shea Smith, Gail Smuda, Stephanie Mahan Stigliano, & Annie Zeybekoglu. The aim of the Prize is to improve and develop the profile of artist’s books and to create opportunities for display and dissemination. Visitors to the exhibition are asked to vote for their favorite entry and this determines the Exhibition Prize winner and makes the event unique in that it is as much about the viewing, looking at and handling of the books as about their making. Participating artists: Tom Acevedo, Ani Avanian, Tess Barbato, Scott T. Barry, Lisa Barthelson, Susan Bauer, Jane Cooper Brayton, Alejandra Carles-Tolra, Brenda Cirioni, Adrienne Der Marderosian, Louie Despres, Brian DiNicola, Zsuzsanna Donnell, Ellen Fisher, Ed Friedman, Ania Gilmore, Christina Goodwin, Gretchen K. Greene, Joseph Hancock, Doug Johnson, Lynne Johnson, Anne Johnstone, Elizabeth Kellogg, Gary Koeppel, Karen Krieger, Priscilla L. Levesque, Juan Lora, Madeleine Lord, C.J. Lori, Saberah Malik, Brett Mason, Bonnie Mineo, Iris Osterman, Christine Palamidessi, Suzanne Papin, Jane Paradise, Ruth Plaster, Cheryl Polcaro, James Powell, Jessica Putnam-Phillips, Jessica Putnam-Phillips, Michael Raucheisin, Beverly Rippel, Elise Roddy, Ruth Rosner, Gregory Sampl, Jocelyn Scheirer, Alex Sewell, George Shaw, Dawn Siebel, David Addison Small, Catherine Stickles, Marian Strangfeld, Andrew Tedesco, Walter Tomasino, Bob Tomolillo, Sylvia Vander Sluis, Annie Zeybekoglu. Participating artists: Barbara Abraham, Barbara Bartlett, Amy L. Burns, Mary Ann Davis, Ann Forbush, Luciana Frigerio, Leslie Fry, Véronique Gambier, Ania Gilmore, Richard L. Harper, CJ Kennedy, Dorsey Hogg, Ann Joppe-Mercure, Nina Jordan, Mary N. Hurwitz, Kevin E. King, Patrick Kinz-Thompson, Debra Kraemer, Carole P. Kunstadt , Jeanne M. Lightfoot, Kevin James Lucey, Mara Marxt Lewis, Eirene Mavodones, Carla Munsat, Jaqueline Overstreet, Chris Perry, David W. Powell, Lorraine Reynolds, Adele V. Sanborn, Carolyn Shattuck, Dawn Siebel, Gail Smuda, Victoria Streker, Marilu Swett, Judith Taylor, Finnie Trimpi, Marcia Volger, Annie Zeybekoglu. Al-Mutanabbi Street Starts Here assembles artists' responses to the tragic loss of a cultural and intellectual hub in Baghdad that occurred in March 5, 2007, by a bomb explosion. The Center for Book Arts will be presenting the exhibition, in collaboration with Alwan for the Arts, Columbia University Libraries, International Print Center New York, and Poets House. This major traveling exhibition, which will feature approximately 250 artists' books and 50 broadsides by artists from around the world, was co-organized by Beau Beausoleil, Founder of the Al-Mutanabbi Street Coalition, and Sarah Bodman, Senior Research Fellow at the Center for Fine Print Research in Bristol, UK. Butler Library, 535 West 114th St.
A project of Beau Beausoleil and Sarah Bodman, coordinated by Sas Colby. presenting works of 84 artists from Europe, USA and Asia.